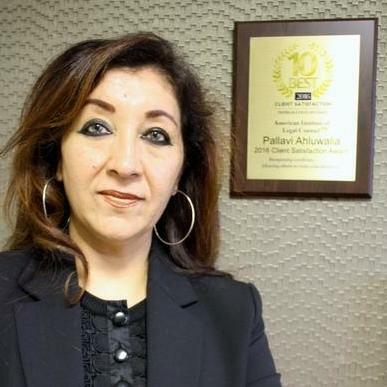 Pallavi Ahluwalia owns and operates Ahluwalia Law Offices, P.C. With the base office in Dallas, TX and satellite office in Connecticut, she represents individuals to Fortune 500 companies, throughout the world on matters related to corporate and employment based Immigration Law. Ms. Ahluwalia also practices in areas of Family Law, Business Law, Contract Law and Civil Litigation. With 13 years of extensive practice, she can understand complex problems of the client and provide a simple and comprehensive solution. Ms. Ahluwalia received her J.D. from Southern Methodist University in Dallas, Texas. "I am working in a Chinese public company which has subsidiaries in USA. My green card is pending for almost 3 years and got denied recently. My friend said that if Ms Pallavi cannot handle it then nobody in Dallas will be able to handle it. Ms Pallavi is really professional and experienced lawyer in dealing with the immigration issues. My visa got approved in two weeks and they continued working hard to appeal to my Green Card. Strongly recommend this law office." "I went to Pallavi during the most stressful time of my life seeking her guidance and representation to respond to an RFE from USCIS and also file AC21 with regards to my employment based I-485 application. I was simply amazed by the customer empathy, integrity, and outstanding support I received from Pallavi and each and every member of her staff. I am very proud to say that because of Pallavi and staff's persistence and exceptional experience I am a green card holder today. Thanks to you and your exceptional team Pallavi. I found my attorney for life!!!" "I have been to at least 10 different high-profile lawyers about my immigration case, and ended up wasting my money. My brother told me about Pallavi, I thought to try her out as well. I was highly impressed during my first visit. She gave me options that actually SAVED me my money. She is so far the MOST HONEST, ethical, and professional lawyer I've met. I'm impressed by the knowledge she has about my case, and her front desk staff is AWESOME!!! Thank you guys for taking such good care of me." "Ahluwalia Law Offices has been wonderful. My journey started with Ahluwalia Law Offices since 2008 from H1B to permanent residence. I never had any single issues with Ahluwalia Law offices and their staff, they always well experienced, trained and organized to handle all type of immigration issues. They have taken all the stress away from me, and I recommend everybody to contact Ahluwalia Law offices for any immigration and legal issues. Thanks!!!!!"